Just the other day, Patrick Hussey met with Flo from Florence and the Machine, along with her pal, Mairead from the Queens of Noize to discover more about this live wire who’s set to stir our spirits during this summer of love. I am sitting in a Shoreditch pub jacked up to near quivering on Lemsip but not just any old Lemsip. It’s the powder kind that comes in little tubes and tastes like hospital floors. I keep pouring the fizzy dust into my mouth. For the last ten minutes I've been waiting on a young singer the music press might describe as ‘up and coming’ or perhaps as a ‘breakthrough starlet’. Bored of convalescence I also have a fat glass of red wine in front of me. It is enormous, like a bloody cistern. Every ten seconds I take a pull and I like the fact it is so big you can almost hide behind it. I begin surveying the scene. Why is everything in Shoreditch black I wonder? I just to start to feel queasy when the reason I am here walks in the door. Florence Welch the gifted performer from Florence and the Machine is looking distracted. Dressed in a peach vintage skirt, hair pinned up and dyed the colour of tattoo roses she does an empty eyed circuit of the pub then looks right through me as I wave from the corner. For half a second she holds my look then turns on her buckle ups and walks out. Not a great start. As the door rattles in its frame I think about why I wanted to interview her. A month ago I was at a dull event at the Whitechapel. There were various arty happenings and wonky haired posers in every corner but it all felt so tame. Suddenly Florence appeared bumbling by a microphone. She was slender, interesting to look at and apparently six feet tall. I didn’t have a clue who she was and I didn’t expect much. Then the music began. The songs were sincere and catchy, fresh and knockabout. And that voice! Americana and soaring but never once phoney. Blimey I thought as she played an experimental number, full of rolling piano and torchy emotion. You could hear the room think there it is. Talent. ‘It’. When she eventually sits down in front of me Florence is nowhere near six feet. Turns out she had on enormous heels that night and is in fact almost short and very little in body. A gust of wind could pick her up. Her face though is very definite, with a delicate yet jutting jaw and big eyes that give her prettiness a cheeky edge. We say hi and I start mumbling about how I hate interviews because they are retarded situations. On a whim I hand her my interview notes which she starts reading aloud, ya da ya der-ing through. She picks an item at random, one of her lyrics followed by my thought in italics. She reads matter-of-factly as if what’s on the page has nothing to do with her. My first question was going to be about her crackling forthcoming single ‘Kiss with a fist’. It’s a great tune with horrific/funny lyrics so slapstick it amounts to the jauntiest track about domestic abuse you’ll ever hear. Plan A was to ask about that violence, how it pervades her songs in this upbeat, celebratory way. Listen to any of her buzzy, guitar driven tracks on her MySpace and you’ll always find it there somewhere, emotional or physical. Take the Bird Song for instance a drummy, bluesy belter that typically veers between the sweetness and destructiveness of love. It contains the image of a bird (presumably a lover) being trapped in a box and trod on. The nastiness of it catches your ear. Her sonic melodrama is grand and obvious but her words also have literary punch. They are somewhere between feminine and feminist, generally concerned with sexuality, spirituality and identity and heavily reminiscent of the Confessional poets. There's a pinch of Sexton and Plath in there and even of the young British writer Gwendoline Riley. Riley also famously wrote about emotion like animals in a box, though in her case a rat. For someone so young (21) her clarity of expression is intriguing. Who are her influences? What does she want from her art? I want to ask big, serious questions but disaster strikes! As I am about to ask where’s all this lyrical craziness coming from when Florence begins looking round the room in her breezy, A.D.D. way. I decide on a gamble, something to get her attention. Plan B it is. Her head whips back and she cracks a huge smile. She pauses then adds the word ‘mostly’ with a grin. ‘Maybe you should try kissing guys. It’s not as smooth.’ she says sassily. ‘I have.’ I snap back, lying (mostly) for effect. She cackles and holds up a hand for me to high five, which to my amazement I do. We are not five minutes in to this and I have just Yankee slapped my own semi fictional gayness. This is going to be interesting. As she continues to point at her eyes she begins to circle the back of her head with her other hand indicating her skull, the seat of her soul. She looks me in the eye then rather struck by the waterproof impossibility of it all then shrugs and then we are off into a million other topics. In her way Florence is a conundrum. There seems to be some dark stuff going on there. She’s dyslexic and dyspraxic and has to battle and collaborate to mine the songs out of her head. Ask her about her writing process and words like shame and fear get mentioned a lot. Yet somehow this all comes together in her songs and personality as a celebration. All the way through our talk she smiles and laughs and it’s fun to watch her roller coaster thought process curl her through the moments. At one point we discuss her affection for the ‘smoke and gold’ of Catholicism. When her father recently informed her she was technically C of E it was a great disappointment. Still like the wannabe Papist she is she says something intriguing about her motivation. ‘Have you done any awful things?’ I enquire. Before going to the bar I tell her to feel free to keep talking into my dictaphone, an i-pod with a tiny mike jammed in the top. At the bar I bump into her manager Mairead from the venerable Queens of Noize. She is tapping at her i-phone as a puppy beagle winds its lead around her stool. How did you find her I ask? We look back at corner to see Florence has picked up the i-pod and is chatting away happily to it. I'm not quite sure what to say so ask what the pup is called? I have to admit a puppy called Bandini impresses me but I try not to let it show. She asks me when we are going to wrap up the interview; they have to film Flo sing somewhere round the corner. ‘Do you wanna come?’ she asks. Cool I say then discover I can’t move, Bandini having wrapped himself twice around my legs. After untangling myself we exit the Old Blue Last and suddenly I am part of an entourage. Florence skips ahead. I glance at the tall, bearded type beside me. He has on a pair of trousers that even by Hoxton standards are a little daft. Black velvet knickerbockers that reach just below his knee. Basically if Death decided to add a pair of vintage hiking trousers to his wardrobe he need look no further. Hiker Death Trouser Man turns out to be rather affable and called James. He may actually be directing Flo’s first video he tells me as we turn into a courtyard and begin climbing to the top of some warehousey apartment block. Inside a flat at the top we find the rest of a Florence’s band and a stubbly man with a video camera who ushers us out onto the balcony. ‘So this is like a thing for Raybans at Glastonbury. Florence is going to sing and then if you could woo, you know WOO! at the end that would be great!’ he says. Stubbly video man ushers us onto the balcony where Florence has reappeared. Without warning she starts singing, her voice spilling over the balcony edge and ricocheting of shadowy buildings lost in the night. She is tiny but belts it out and the band join in with gusto. All around I watch the hip rent-a-crowd I am part of as they are captivated by the sound. After it is done we pile down the stairs, Florence behind me. I tell her she might like to read Keith Douglas; one of her lines reminds me of him. ‘The war poet?’ she says, clearly familiar. Outside there’s one more rock and roll moment. Tabitha, the other Queen of Noize pulls up in of all things a Winnebago. It’s big and beige and barely fits into the narrow East End streets. A number of the entourage climb in and I think ‘why not?’ and climb in with HDTM and a photographer who has appeared from nowhere. Inside there is an empty birdcage and the smell of family holidays. Bandini bounces around jumping onto hipster laps and now thoroughly gone on booze and decongestant I start badgering the photographer about some load of rubbish I can’t recall. ‘Have I got any room?’ asks Tabitha as she grinds against a Ford Focus. What follows is a jolty ride through the dark and rain kissed streets, Florence singing still and me chatting away about god knows what to Hiker Death Trouser Man and the photographer. After that? I am not quite sure. The Queens need to talk video turkey with HDTM so I make my exit. I remember chips and Kingsland, blurry images of goodbyes and streetlights. I’m not sure but I think my taxi driver made me run into a shop and buy him Silk Cut on my switch. In any case I wake up in the spare bed at Run-Riot HQ and think what a grand night, then feel my cold still ripple beneath the hangover. Knowing I have booked myself another week’s sickness I reach over and fish my i-pod out from my bag. I am curious to see what ‘answers’ Florence has left on there. I pull out the little mike and jack in my headphones. None! Like a fool I forgot to switch it on. What has humanity lost here I wonder as I settle back into the strange pillow and Lemsipy dreams. Debut single Kiss with a Fist out on Moshi Moshi Singles Club on 9th June. 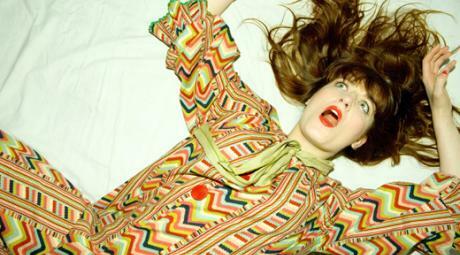 Florence and The Machine will be headlining on Tues, 10th June at 229 Gt Portland Street.